chockohlawtay: Maple Oat "Petit Fours"
These are not granola bites, and they are not cubed cookies. They are soft, they are chewy. They are moist, they are tasty. Edit: they are dang tasty! And they don't need to be baked! Who wants to turn on an oven when its 105 degrees outside? Um, not me. And probably you too... unless you live in a fridge. 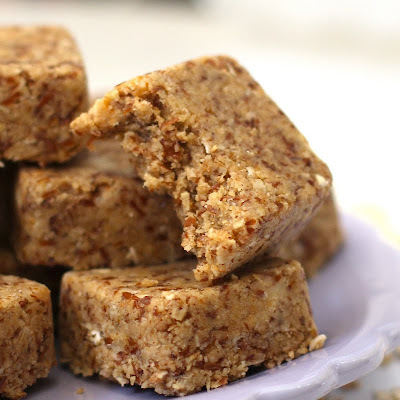 I was originally trying to make Oatmeal & Fruit Jam Bars, but I didn't feel like cutting up pieces of parchment paper and lining a brownie pan (silly reason I know), so instead, I pressed the mixture meant for the crust into a chocolate mold. As I was eating a petit four, I realized that the texture was really soft, similar to Larabars. The petit fours were moist from the oat flour and maple syrup, making these cute like cubes low-glycemic and more likely to sustain your energy and hunger for a longer time. They were really nutty due to the flax, and I immediately wanted another one. Quantity control, Jessica, control! Let's just say I took another one. Or three. 1. Blend the oats and rice cereal in a blender (I like to see some oats in there, so I didn't blend for too long) enough to get most of it as flour. 2. 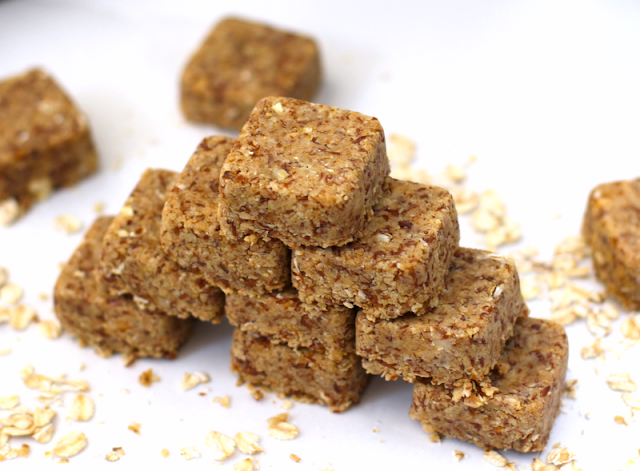 Using a stand mixer or hand mixer, mix together the oat/rice cereal mixture with the protein powder, flax and salt. 3. In a medium-sized bowl, stir together the coconut oil, maple syrup and extracts. Mix into the dry ingredients (should have a moist crumble consistency). Add any optional add-ins now. 6. Pop out the "petit fours" and they are ready! If you are using a loaf pan, remove from the container and slice into desired size. Bars would be great too! Store covered in the fridge. 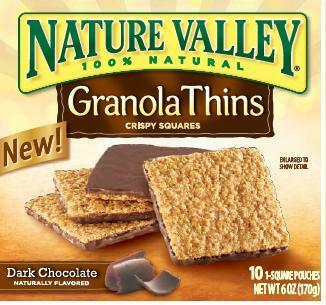 Note: these are really soft at room temperature (which is a good thing! ), and a little more firm when on the cold side... I prefer it at room temp, but it's your choice. I topped a couple petit fours with strawberry jam this morning (sooo gooood), but if you are using cinnamon in the mix, I wouldn't recommend the jam on top... not a good match in my opinion! 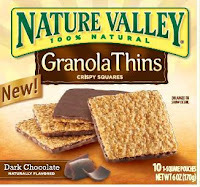 PS: now that I think of it, what would be great is a petit four dipped slightly into dark chocolate... similar to those Nature Valley Granola Thins... yum! I'm not sure... maybe try replacing it with more oat flour? It might change the taste and texture though. Hey! I'm really enjoying your blog Jessica! Thanks for these wonderful recipes! I'll be coming back often! 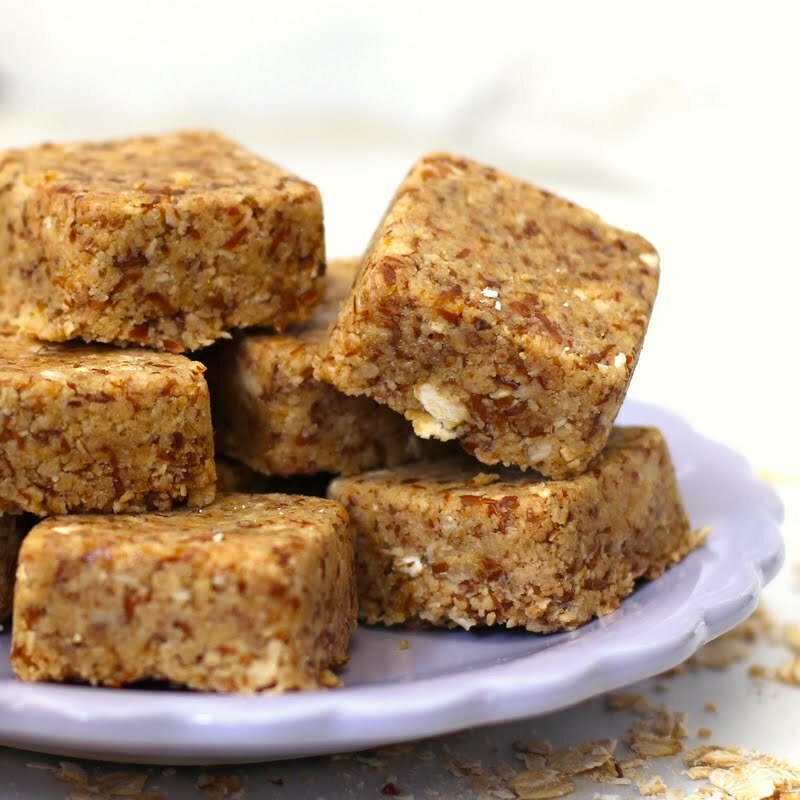 Ooo, these look like the oat versions of Larabars!!! Looks so tasty!! !